When our brainwaves are stable and we are in our neutral mind, we do not react at the slightest annoyance. When we do not react, we are mentally available to respond appropriately to situations as they arise. Eyes slightly open, looking at the tip of the nose. Wha He Guru means ecstasy and imprints the mind with a feeling of cosmic well being. Continue for 31 minutes. This can be done for 11, 15 and 22 minutes, but for the full effect do it for 31 minutes for at least 40 days. 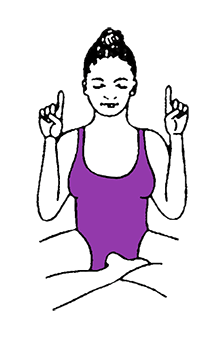 Hold the position and listen mentally to the mantra for 2 minutes. Inhale deeply, hold the breath, tense the whole body as tight as you can, exhale. Repeat 2 more times or a total of 3 times. Relax on your back or meditate afterwards. Do not jump up immediately. This meditation will bring your brainwaves to the frequency of the neutral mind. In the neutral mind we are tolerant and we don't take things personally. This meditation is highly recommended for teenagers whose raging hormones cause their brainwaves to go out of control. (Pay them to do it. It is worth it!) It will help everyone keep their cool. This meditation also opens up the heart chakra and activates the navel center. This mantra has also been given as a prosperity mantra. Like other Kundalini Yoga meditations, there are many benefits that are revealed as you practice. Positive results are guaranteed. If you have never done a 40 day meditation, by all means give yourself this wonderful gift. Pull the navel point toward the spine and release with each part of the mantra. I use meditations like this to play with the energy in my spine. It feels good and keeps me conscious and present. It is best to make this mediation part of your morning Sadhana to set your vibration for the day. If you are in a time crunch, shorten the time to 11, 15, or 22 minutes, but do not miss a day. Consistency is necessary to maintain the vibration. This is something which will come to you with practice. For instance you may feel an energy around and inside you like you have shifted dimensions but are still there. Instead of thinking this is God, the Zone or whatever, think of this as your soul, you essence, your expanded pure light being. In this way you will begin to train yourself to find your identity in your expanded being and your internal identity. This is what we want - to let go of the idea that we are a limited ego. The 2 minutes of listening for the mantra before the 3 squeezes is in an approximate amount of time. Just relax and listen inside for the mantra for a time and then do the squeezes. You do not have to time this part. I find that I need to deeply relax and let go after the 31 minutes for about 10 minutes. After that time I am very different, simultaneously more alive and more at peace. Definitely do not jump up immediately afterwards. If there is a time crunch then do the meditation for less time and keep time to relax.